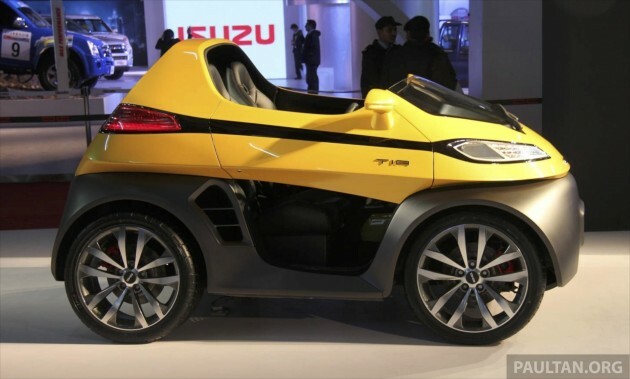 DC Design not only had the Eleron open-top SUV on show in Delhi – the Indian design firm, headed by designer Dilip Chhabria, also showcased the Tia, a compact two-seater, mid-engined coupe, sans roof. Shades of the Smart fortwo, yes. Power comes from a 1.2 litre turbocharged petrol lump, and the Euro V-compliant unit is good for 120 hp and 190 Nm. Paired with a four-speed automatic transmission, which drives the rear wheels, the Tia is capable of doing the century sprint in nine seconds and reaches a top speed of 160 km/h. The 2,550 mm-long Tia – which sits on 18-inch wheels – tips the scales at 950 kg, and like the Eleron, features a space frame design and carbon composite body. Like the Eleron, reports indicate that DC is planning to bring the compact out into the market sometime in 2016. 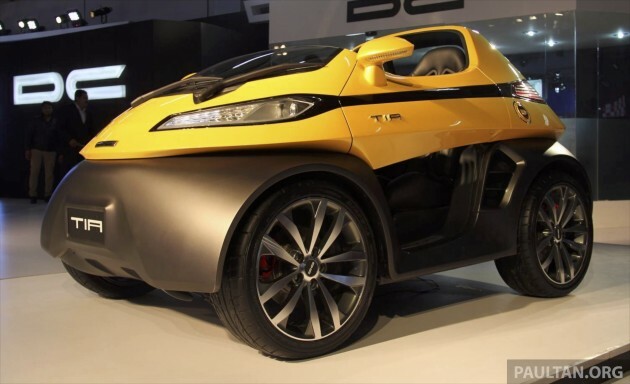 Live photos of the DC Design Tia courtesy of Faisal from Motorbeam India. looks like something u find in an amusement park, not on the road..
looks like the car being crashed and squashed from both ends after car accident…. When the driver hits the brake, this car will flip forward. I will laugh and point my finger at those driving this object. actually this car looks rather decent to me, shame about the interior though, it seems like it has come out from something of an 80’s or 90’s. Very cute!!!Kawaiii! If its cheap and drives as fast as a picanto why not!! Next Post: Mazda 5 to be updated with SkyActiv tech in Malaysia?